New Jersey canNOT be left behind! So it may come as a surprise to state residents that legislative leadership in the state is considering a sizable increase in the state’s corporate tax rate this year, from its current 9 percent to 12 percent. If enacted, New Jersey would tie Iowa for the highest rate in the country. 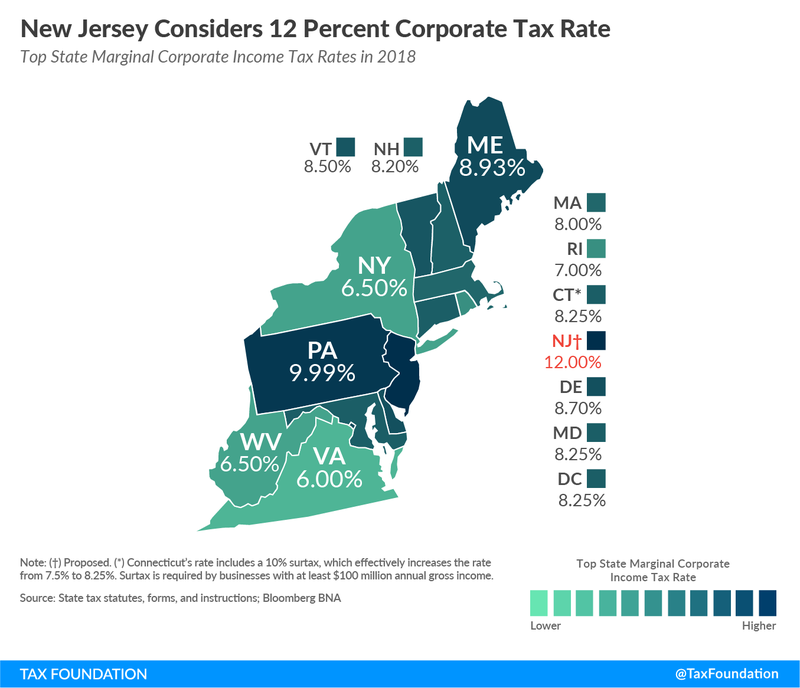 Perhaps more importantly, though, Jersey’s corporate rate would be higher than neighbor Pennsylvania (9.99 percent) and almost double that of New York (6.5 percent). Now, the “thinking” is that the large federal corporate tax cut leaves money on the table for them to grab. The Tax Foundation shows the obvious problem: the feds may have put money back in corporate coffers…but those companies can move to other states. Once the tax pain is great enough, they may very well leave. Even before the business tax boost (it hasn’t actually passed yet), NJ has higher tax rates than surrounding states… at least the highest marginal rate. This new landscape is not going away in a few years either. In fact, one of the notable state tax trends in the last decade has been consistent reductions in state corporate taxes. Why? There appears to be a general consensus in state policy circles that corporate capital is highly mobile; that is, if you tax it too much, it tends to move (and then you can’t get any revenue out of it). 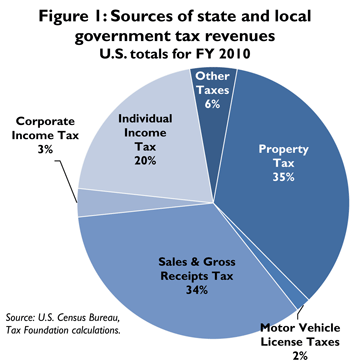 What’s more, corporate taxes make up such a small portion of total state and local tax collections (just 3.7 percent in FY 2014) that cutting state corporate rates can be an attractive economic tool to boost growth without sacrificing lots of revenue that legislators use to pay for government services. Now, those income taxes aren’t split up on that page, but I can get them here. This is stupid. But of course. Wirepoints: Leaving Illinois: One family’s math – Wirepoints Original — looking at what one family would save in taxes if they left Illinois. Tax Foundation: Two States Cut Taxes Due to Federal Tax Reform – those two states are Georgia and Idaho. They made a variety of adjustments so that they wouldn’t automatically get increased tax revenues due to federal changes. National Review: Private Universities Protest the ‘Endowment Tax’ — this tax is on university endowments that are over $500,000 per student… and Here’s a Brookings Institute take on it as well. This is easily going to get messy, so I’m adding only one category of deduction right now: state/local property taxes. So, to make it simple, I’m going to just do multiple levels of property taxes — from $0 up to $30,000, in increments of $10,000 to plot. Yes, I know about the SALT cap… that’s the point. How screwed are people with higher property taxes? The first obvious thing — there is no difference between all the situations with the post-TCJA bill – the property tax deduction is capped at $10,000…and that’s below the standard deduction. So the post-TCJA results for all the situations are just the same as the standard deduction. The question is whether post-TCJA is worse than the prior. Next, I’m even going to keep cases where the property tax is higher than the income — I can easily think of situations like that, such as where a retired person is drawing down assets and makes little or no income. I was in a situation like that in a few years I was a grad student – I had 0 income in some of the years, but I had some money I was living off of. Even if these situations were highly unrealistic, I’m just trying to get at where the problems (or, rather, the political problems) exist — basically, who would have to pay higher federal income tax under the bill? This time, I’m going to start with what I consider the non-deceptive graph: what are the actual amounts being paid in the different situations? So in this, I have the new level as a black dashed line… and it’s really tough to see what’s going on. It seems the black line is in the middle at some of the lower income levels. Hmmm. Well, we’ll look at that more closely in a bit. First, let’s check the tax rate levels. Hmmm. So for high income levels, I see the new TCJA tax rates are lower. But there’s a problem at lower higher property tax and lower income levels. In all of these, a higher income leads to higher federal income taxes. So nothing crazy right now… because I have the property tax at one level per curve… which makes sense — the property tax doesn’t depend on your income after all (that’s for next week). So let’s start with the $10K property tax. Again, this is lower than the standard deduction for a single person under TCJA – the only loser is the $20K income level. If you’re paying half your income in property taxes… well…. But that one doesn’t look so insane. Here we go — $20K property tax. Uhhhh, that’s start looking weird. Remember, where the curve goes above the zero, they’re paying more in taxes under the new bill. So… anybody with under $120K in income taxes who has $20K in property taxes loses under the new bill… but there’s also some weird bobble around $400K in income…. But before I comment on that, let’s check the $30K in property tax level. Uh yeah, that looks odd. On a per capita basis, eh… that’s still an average. New York is a huge state. The two most expensive counties—Westchester and Nassau—are both in New York. Median taxes paid in Westchester County were $9,003 in 2017, followed by Nassau County at $8,711. Compare these figures with the national median for that year: $2,127. So look. Most people pay property tax below the SALT cap. I’m doing something extremely artificial – the only people paying $30K+ in property taxes have very high incomes, in very specific locations, and I’m just playing through combinations. I will try something a little different with state income taxes next week… but are you getting the idea? The idea that the only people who may be getting screwed are paying a disproportionate amount of their incomes to state & local taxes?